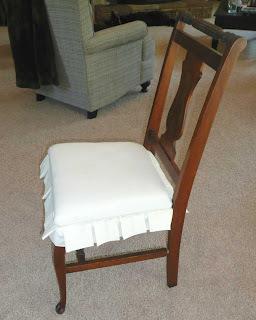 Gus & Lula: No Sew Chair Ruffles! 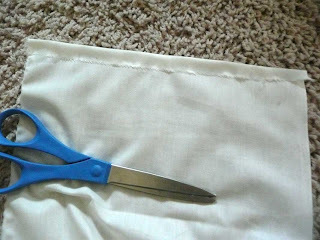 To figure out how much fabric you need, decide how long you want your ruffle to be. I wanted mine to be about 4" long. Then double that length and add at least one inch. So for my 4" ruffle, I needed a 9" wide strip of fabric. 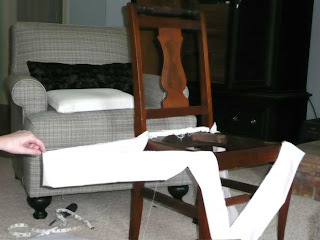 Then figure out the length of the fabric: I added up all the lengths of the sides of my chair seat (i.e. 13+15+15+17= 60) and then multiplied that times 2. (And then I added a little extra for good measure. So I needed a strip of fabric that was 130"x9" for each chair. 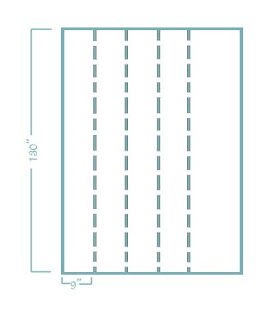 I'm a very visual person, so I sketched something like this out to help me figure out how many yards I would need: So since all my strips fit side by side on a 45" wide bolt of fabric, I just needed a piece that was 130" long. (130"/36"(or 1 yard) = 3.6 yards.) Is your brain hurting yet? Now that I had my fabric, I had to cut out the strips I needed for the ruffles. (I actually tore mine so I wouldn't have to stress about cutting a straight line.) 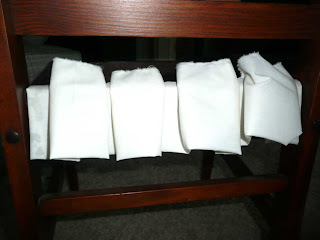 Then I folded just a quarter inch or so of the ends over and used fabric glue to keep them in place. Then I folded the fabric in half so I had a 4.5" wide strip of fabric. Then I was ready to staple - finally! Side note - I should mention here that my chair is a little different from most in that the back of it had to be done separately since the sides of the seat are not one continuous piece all the way around - the back of the chair separates the back of the seat from the other 3 sides. (Does that make sense at all?) 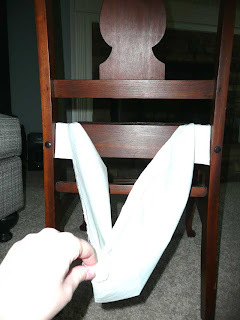 If this is the case with your chair, multiply the length of the back of the chair by 2, cut the fabric to that length, fold the ends under with fabric glue, and then start with the instructions below. It's all down-hill from here. If you have a chair like mine, do the back first. 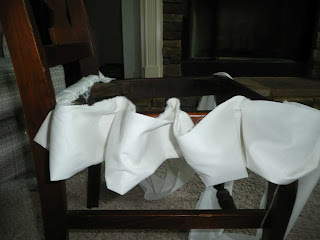 Staple each end of the strip of fabric to the corners of the back, then follow the directions below for the rest of the chair. 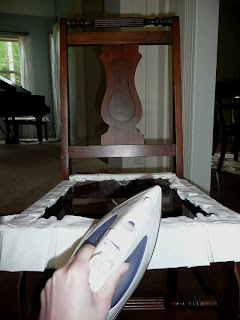 Be careful to staple far enough back so that the staples won't show when you replace the seat of the chair! If you're OK with less than crisp ruffles, you can stop here. I wanted mine a little more tailored looking, though, so I took out the iron and went over them a little. It also helped them to lay flat instead of sticking straight out. Then I replaced my seat, and voila! 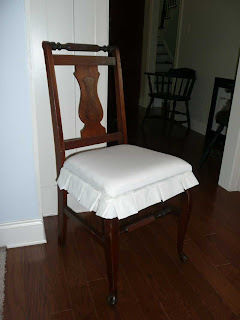 I have a newly recovered chair with ruffles! Now just 3 more to go! wow this is great, I bet this makes Kimbas fave! This is the coolest tutorial ever! I love this look!! Very cool directions ! So posh looking now ! Love the ruffle!! 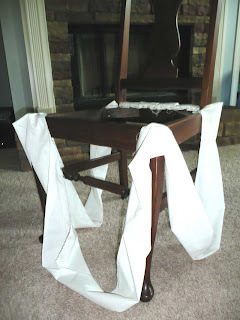 Too bad my chairs are fully upholstered. I'll have too be thinking about how I can use this in other ways. Wow, you're good! I love it! Oh my - that is too cute! Now that is my kind of decorating....no sewing. Woo hoo!!! What a great project! I will look at chairs differently now! Love it! 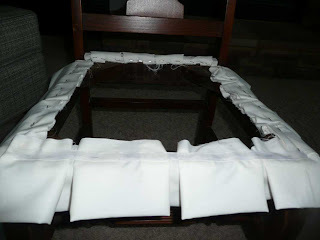 Looks great and I love the way you let the staple gun do most of the work for you to make the pleats! Very clever. OMGoodness!!! I love, love, LOVE this!! Oh wow you are a genious! I'm totally gonna use this on a living room chair I'm reupholstering! Great job!! !